Mohammadinejad, R., Pourseyedi, S., Baghizadeh, A., Ranjbar, S., Mansoori, G. (2013). Synthesis of Silver Nanoparticles Using Silybum Marianum Seed Extract. International Journal of Nanoscience and Nanotechnology, 9(4), 221-226. R. Mohammadinejad; Sh. Pourseyedi; A. Baghizadeh; Sh. Ranjbar; G. A. Mansoori. "Synthesis of Silver Nanoparticles Using Silybum Marianum Seed Extract". 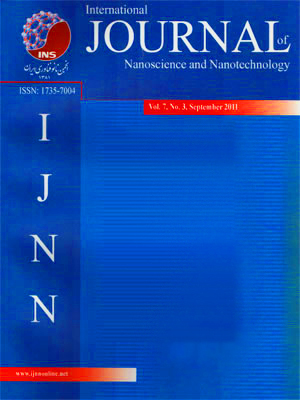 International Journal of Nanoscience and Nanotechnology, 9, 4, 2013, 221-226. Mohammadinejad, R., Pourseyedi, S., Baghizadeh, A., Ranjbar, S., Mansoori, G. (2013). 'Synthesis of Silver Nanoparticles Using Silybum Marianum Seed Extract', International Journal of Nanoscience and Nanotechnology, 9(4), pp. 221-226. Mohammadinejad, R., Pourseyedi, S., Baghizadeh, A., Ranjbar, S., Mansoori, G. Synthesis of Silver Nanoparticles Using Silybum Marianum Seed Extract. International Journal of Nanoscience and Nanotechnology, 2013; 9(4): 221-226. Green synthesis of nanoparticles, as fundamental building blocks of nanotechnology, has recently attracted considerable attention. Silver nanoparticles have unique physiochemical, biological and environmental properties which make them useful in a wide range of applications. In the present paper we report our research results on biosynthesis of silver nanoparticles from silver precursor using milk-thistle plant (Silybum marianum) seed extract. The resulting synthesized Ag nanoparticles (AgNPs) were characterized with UV– visible spectroscopy, X-ray diffraction (XRD) and transmission electron microscopy (TEM). Our measurements showed that S. marianum seed extract can mediate facile and eco-friendly biosynthesis of colloidal spherical silver nanoparticles (AgNPs) of size range 1–25 nm. The colloidal AgNPs were formed at room temperature and were observed to be highly stable even after 6 months.